Once upon a time, I was on a search for a pattern like this. I found this, and not only paid $20 for the damn magazine (the English Rebecca), but I also a ridiculous amount of money on the yarn for it that I don't even love (it's called yarn shopping with two toddlers...doesn't work). Anyway, the bolero just wasn't working. At all. So....my dreams of wearing a bolero turned into the reality of a post-baby belly autumn in need of comfy sweaters. And hence, on another search, I finally found this pattern from www.glampyre.com. And then I bought more of the yarn that I don't even like. Which brings us finally to the end result of this sweater. I still don't like the yarn. But it's a comfy sweater--cozy--and perfect for hiding a little post-baby pooch, which will come in handy soon if I keep eating all these banana splits. Pattern Notes: This is a great top down knit sweater pattern. Suitable for beginners, I'd say. 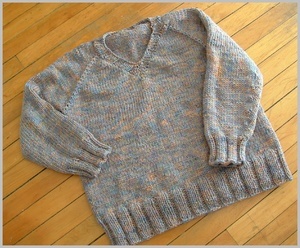 And perfect for an "easy" knit for a more experienced knitter (it was great for watching movies, and stoplights too!). I was a bit confused by some things in the pattern, but Stephanie, who whote it, was AWESOME about clarifying, and even changing the pattern to correct the confusion. The original pattern didn't have the ribbed v-neck, but I thought mine looked unfinished when it was done, so I picked up stitches around the neck and added the ribbing there. I think I'll try this pattern again sometime later--with yarn I love (I'm thinking some handspun handdyed wool with lots of color variation...yummy! ).